Basseterre, St. Kitts – More than a million cruise ship tourists are expected to visit St. Kitts and Nevis during the 2017-2018 season – a first for the federation. 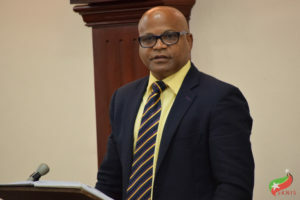 During today’s sitting of the National Assembly, Minister of Tourism the Honourable Lindsay Grant gave a report of the vibrant and ongoing success of the St. Kitts and Nevis tourism industry. He said that a 4.4 percent increase in stayover visitors is expected this year compared with last year. St. Kitts and Nevis welcomed about 125,000 stayover visitors in 2016. In terms of cruise tourism, Minister Grant explained that the one million passenger mark was missed last year by a mere 2,000 tourists. This year, however, it is expected that there will be a 50 percent increase. In the hotel arena, the Minister of Tourism said that on Nov. 17, the Caribbean’s first Park Hyatt will be officially opened in St. Kitts. It had its soft opening Nov. 1. The tourism minister said that this shows the high level of trust and confidence that Park Hyatt has in the government and the people of St. Kitts and Nevis. Minister Grant mentioned that on Nov. 11, there was a ground-breaking ceremony for the US$120 million Seaview Gardens Hotel Project being undertaken by St. Kitts-Nevis Royal Limited. It will feature a 350-room hotel, condominiums, villas, a casino, as well as commercial and recreational spaces on just more than 19 acres of land. “Something good is happening in St. Kitts and Nevis under Team Unity,” said the Minister of Tourism.